Narendra Modi’s ban on Rs500 and Rs1000 notes and the resulting cash shortage has hit the movement of goods in India. The crisis sparked by the shortage of cash in India following Prime Minister Narendra Modi’s anti-graft measure to ban Rs500 and Rs1000 notes has hit the movement of goods in Asia’s third-largest economy. 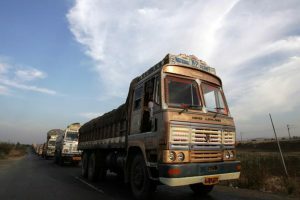 More than half of an estimated 9.3 million trucks under the All India Motor Transport Congress have been affected as drivers abandon vehicles mid-way into their trip after running out of cash, according to Naveen Gupta, secretary general of the group. India’s roads carry about 65% of the country’s freight. That adds to the worries of a government battling to keep ATMs running after efforts to ease withdrawals failed to keep pace for the fifth straight day. After a teary-eyed emotional appeal to citizens to bear some pain and back the fight against corruption, Modi on Monday defended his move to withdraw Rs500 and Rs1,000 notes, which accounted for 86% of money in circulation. The State Bank of India’s ATM at the ministry of finance’s main office in the heart of the nation’s capital wasn’t dispensing cash as of noon on Monday. The cash machines across the nation are being reconfigured to dispense the new banknotes as currently they are able to provide only Rs100 notes from one of the four trays. “The banks are trying their best to replenish those trays,” said Das. The government on Sunday raised the daily limit on withdrawals from cash dispensing machines to Rs2,500, while weekly cap has been increased to Rs24,000. The limit of withdrawals from a current account held at banks has been increased to Rs50,000 per week in a move to help small businesses pay wages, Das said. Old high-denomination notes will be accepted at places such as government hospitals, utilities and fuel stations until 24 November, he said. It has also extended the suspension of tolls on national highways through 18 November, the ministry of road transport and highways said in a statement on Monday. This is the second time that an extension has been granted—it first ran to 11 November, then until 14 November. Modi is seeking to fulfil his election promise of recovering illegal income, locally known as black money. The government will take more steps to curb tax evasion, including action against benami property, he said at an event in Goa on Sunday. Benami is property owned by one person but held in the name of a third party. Ministry of finance’s Das said the government will increase cash supply to post offices and asked people not to panic. India’s roads carry about 65% of the country’s freight. Next story Trucks to enter Delhi only after midnight till January 31…!! !